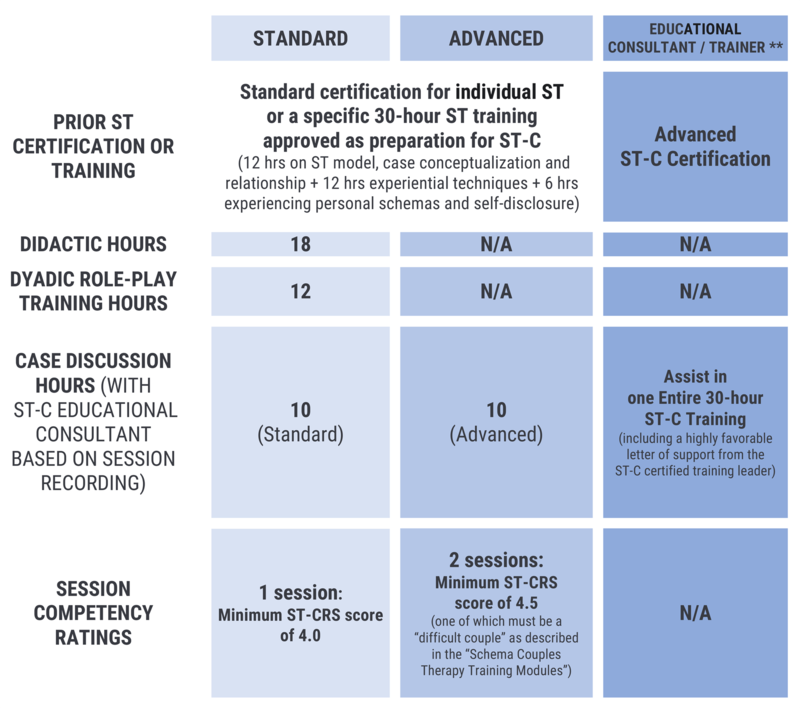 For fuller details of what is required of the session recording(s), see: Schema Therapy for Couples (ST-C): How to submit your session recording(s) to be rated and prepare your application for certification. * Note: Grand-parenting will be considered in special cases where applicants demonstrate an exception level of training and experience in both couples therapy and schema therapy. All applicants, however, must submit videotaped sessions and must meet ST-CRS cut-offs as described above. ** Note: The term "Educational Consultant / Trainer" is used in place of "Supervisor." This respects cross jurisdictional licensing restrictions on supervision and reflects the understanding that the Consultant is not clinically responsible for the case, but advises and educates on the model.